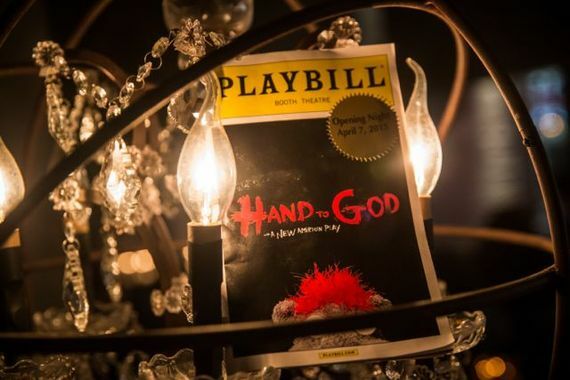 In the thought-provoking and darkly hilarious new Broadway play, Hand to God, Jason, a well-meaning soft-spoken teenager, creates a hand puppet from a gray sock, red fuzz and some felt. Jason's mother is convinced that a puppet show will give her son a much needed creative outlet and help him work through his grief after losing his father. But what ensues is completely unpredictable. So at the play's recent opening night, it seemed fitting to ask the celebrity audience, some of Broadway's finest, what creative outlet they had when they were kids. In fact, both the play's director, Moritz von Stuelpnagel and playwright, Robert Askins put on puppet shows. 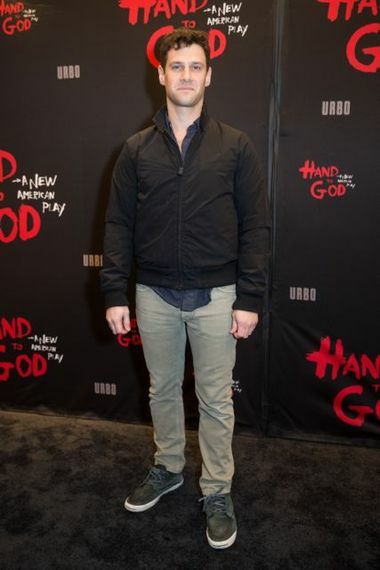 "It was a way to give voice to some of the things that I wanted to say and see the audience deal with," said von Stuelpnagel who shared that Hand to God had a very humble beginning Off Off Broadway. "It's a Cinderella story that you don't think is actually possible," he said of the show's momentous move to the Great White Way. From Smash star Megan Hilty to Justin Bartha and more, click to this Parade.com story to read about their childhood creative pursuits. For more information about Hand to God visit, handtogodbroadway.com.